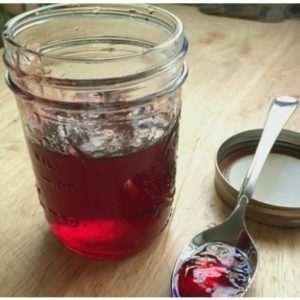 January 12, 2017 0 comments on "Canning Pomegranate Jelly"
Canning pomegranate jelly is fun and easy. You use store-bought pomegranate juice to make it, so there’s no messing around with straining the juice from pomegranate fruits. Combine the pomegranate juice and lime juice in a large stock pot. Sprinkle the pectin on top of the juice mixture and use a whisk to mix it together. Stirring constantly, heat until boiling. Boil for one minute. Remove the pan from the heat. Remove any foam with a metal spoon. Ladle the jelly into hot sterilized jars, leaving 1/4 inch head space, and process in boiling water canner for 10 minutes.